IFTTT is a web service that lets you do some basic plumbing between web services. The idea is that if something happens on one service (referred to by IFTTT as ‘channels’) then you do something else on another (options also exist for other triggers including time, SMS and external sensors). 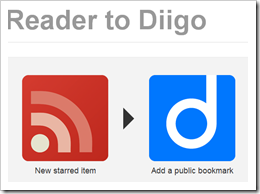 To illustrate this I use IFTTT to bookmark anything I star in Google Reader in my Diigo account. Setting up these recipes takes no more than selecting a trigger and assigning an action, so no coding required. There are currently 41 channels in IFTTT (including Twitter, Facebook and RSS feeds) users can link together in this way. One of the most recent additions is Google Drive. With Google Drive integration you can store files or, the one that interests me more, insert a new row in a Google Spreadsheet. Log rain in your city to a spreadsheet as it happens. RSS is great for accessing machine readable data but often one of the limitations, particularly with blogs, is results are limited to the last 10 or so items. This has created problems in some of my projects like the OERRI Projects Dashboard where I need all the posts. The solution to date has been to rely on 3rd party services like the Google Feed API. Is a service which lets users collect posts around topics and display in an online magazine format. I use scoop.it to collect examples of how people are using Google Apps Script. Since June last year I’ve collected over 200 examples. I mainly do this for my own benefit, in part as a directed task to make sure I’m up-to-date with Apps Script developments, but also as a reference source of apps script examples. I can query these examples using a Google search but it concerns me that I’ve got no way to bulk export the data. Recently Scoop.it added a RSS option so I use this recipe to Backup Scoop.it to Google Spreadsheet. There’s lots more you could do with the data now it’s in a spreadsheet and once I’ve built up a corpus I’ll have a play. One thing to note which might put some people off is to allow IFTTT to add data for you, you need to give them authenticated access to your Google Drive. I can live with that risk, but you might not.